Bangalore city offers a plethora of romantic places for the lovebirds. Gone are the days of the conventional affair at a hotel or any secluded area. Bangalore celebrates romance in all its glory and gives the couple choices ranging from luxurious rooftop restaurants, water parks, adventure sites, lakes, gardens and mesmerising hill views. Let them know what they mean to you by planning a romantic getaway to one of these places. Walk hand-in-hand through the clouds as you climb your way up to Bangalore's paradise hill. The top offers a beautiful view surrounded by the lush greens of trees and the pink hues of the dawn. Timing: It's the best to leave after midnight if you're staying in the city. Reach the hilltop just in time to catch that glorious sunrise with your partner. Things to do: The sunrise and sunset can be rejuvenating. Small treks, vineyard tour, and paragliding are also some of the activities you can enjoy. A treat for nature photographers, the Hebbal lake is nested inside a park giving the best of nature's charm to the visitors. Some beautiful birds enjoy coming to the lake including pelicans and swallows. If you are into bird watching, this place is perfect for you! You can meet a lot of fellow hobbyists to befriend as well. Kingfisher, tailor bird, white eye love to dwell on the place and enjoy the tall green trees and the sparkling water in the vicinity. Timing: The lake is open from 7:00 AM to 8:00 PM for the public. Things to do: Sunday family picnics are delightful. The place to be for photographers and bird watchers. Spice up your love life with the charming venue. The Tao terrace is a luxury pan-Asian dining place to visit with your loved one. The astounding ambience, the cosy setting makes the perfect dinner place especially if you like Asian cuisine. You will have an unforgettable experience and feel spoiled by the appetising food choices on the menu. Things to do: Don't miss out on the Sushi platter- a speciality and the delicious ice cream. If you want your date to be action packed with fun activities, this is the place to be. A massive artificial beach, beautiful boating park and a plethora of water rides are sure to bring a spark in your date. Ditch the hot summer day and head over to the Lumbini Gardens to enjoy with your special someone now! Things to do: Make your date perfect by indulging in the Pleasure Ride, Spanish Bull ride, Trampoline Bungee, and wave pool. A picturesque waterfall away from the city bustles and yet nearby Bangalore is an excellent option for a weekend getaway. Right after the monsoons, the place gets a fresh makeover with exotic plants booming and water flowing down the rocks with massive impact giving a milky white texture. The view is magnificent. Timing: It takes hardly 1 hour from the Bangalore city. Things to do: Hop in with your partner to enjoy a romantic bath under the waterfall. Do you want to spend your date under a starlit sky with the melodious sound of the river in the background? Give the right touch of Bollywood fantasy to your time with your partner at the Sakleshpur Camp. It is one of the off-beaten places for having a romantic vacation. You can go for camping at the banks of the river or try exhilarating sports like zip lining. Explore the raw beauty of nature around you with a trek to the depth of the wilderness. It is an amazing place for the couples who are looking to get away from city chaos. Timing: It takes about 4 hours to reach from the city to the campsite. Things to do: Boating, swimming, and camping are dearly enjoyed by the couples. The soft music, the nice lighting, a serene environment and elite decor is what makes Olive beach stand out. Famous for its authentic European and Mediterranean cuisine complimenting the European setup, the olive beach is a hit among the couples of the city. A Sunday brunch at this exquisite restaurant will give the perfect start to your romantic day together. Timing: Sunday to Thursday, the place remains open from 12:00 PM to 3:30 PM. For Friday and Saturday, the timing is 12:00 PM to 3:30 PM and then 7:00 PM to 1:00 AM. Things to do: The eight-hour lamb is a must try. Raviollis, Risottos and the pepperoni pizza is delectable. Surprise your beloved with a floating date! Beat the cliched places for couples and head over to the Jakkur Airfield to indulge in a thrilling experience as the hot air balloon soars high. The view from the top is simply stunning, with a panoramic view of the Bangalore landscape. This stimulating adventure is just perfect to woo your partner. Things to do: Embrace the landscape and the beautiful view. Once done, you can also go for Parasailing done at the same airfield. Grasshopper offers a breathtakingly romantic and mesmerising setting for you and your significant other to enjoy the dinner date. A sensuous blend of mouth-watering cuisine and the poised environment is the recipe for a lovey-dovey night! The restaurant is nestled on a farm that gives a unique experience to the visitors. This beautiful dining place with a fabulous ambience will provide you with extra brownie points in the relationship. Things to do: It is famous for its seven-course meal that you can try. Prawns With Ginger, Orange And Oregano Salad With Olives, and the almond ice cream is just delicious! There is a good reason, Bangalore boasts of the tag ?The Garden City?. Cubbon Park is one of the contributors of this title having tall green trees, blooming exotic flowers, and aesthetically designed statues. It's a fantastic place for couples to spend some time together, surrounded by lush greenery and refreshing aroma of nature at its best. Timing: The park is open on all days from 6:00 AM to 6:00 PM. Things to do: A romantic walk in the serene environment is energising. The place is all popular among the photographers owing to its charming natural beauty. The Bannerghatta National park offers unique packages to make your romantic getaway worthwhile. The large zoo, aquarium, butterfly centre, snake house, safari park and trekking trails are the many options that you can try with your partner. Dip into the wild magic of the natural park by taking your beloved on an enchanting Safari ride. Timing: The park remains open from 9:30 AM to 5:00 PM. It's closed on Tuesday. Things to do: A treat for photographers, the magical safari ride will let you see leopards, jackals, porcupine, tiger, elephants, and cobras. The home to an assortment of eye-catching flora and fauna, The Lalbagh Botanical Garden houses a glass house, a lake, and an aquarium to add on to its beauty. It has a grand collection of tropical plants which lures in visitors from all around the country. Various events, shows, and Melas are held where the Garden flaunts of its beauty. It's a delight to visit the place at dusk and dawn. The surrounding has a romantic touch to it perfect for the couples. Things to do: Visit the flower show arranged on the Independence Day and Republic Day. Mango Mela during June offers a diverse variety of Mangoes to pick from. Ulsoor Lake is one of the most significant lakes in Bangalore. Several islands present around magnifies the beauty of this lake. Hop on the boat with your loved one to spend a calm and peaceful evening together. The place has a natural charm which it attains from the extravagant greenery in the surrounding. Things to do: Boating is a favourite activity. There are many coffee shops and eating options available nearby to relish after your ride. It is the highest lounge in South India, offering a breathtaking view of the city. The rooftop seating, fancy bar, and a romantic panorama is the right ingredient to make your visit an intimate happening. Situated on the top of the World Trade Center, The Ultralounge offers multiple cuisines ranging from Chinese and Korean to Japanese and Thai. Take your partner for a candle-lit dinner or a fulfilling brunch to win their heart. Things to do: The Sushi Platter, Chicken Satay, and Chocolate Cake are the most loved by the guests. A funky, hip Retro-bar with live music and excellent DJ is what you need to make your evening exciting. Loveshack is just that and so much more. The fairy lights, open terrace, and beautiful decor gives the place a cosy and adorable outlook. Take your partner on a Karaoke night to the Loveshack and sing a romantic song to sweep her off the floor! Things to do: The Bacon wrapped prawns, Chicken wings, Nachos and Chocolate tart, are loved by all. A night with your loved one, a delicious range of food options and exotic cocktails are what you need to make your day. For couples who also happen to be oenophilic (having eternal love for wine), what could be better than taking a Vineyard Tour and enjoy some grape stomping and tasting sessions. It is not necessary for you to be a wine expert or connoisseur to visit a Vineyard. The charming views of the vineyard and walking around the field are stress busters and you can just enjoy watching the chateaux. Couples can flock to some of the most romantic vineyards and enjoy not only tasting, but also catch the sunset views and explore the process of making wine. If your partner does not love wine, he/she will definitely turn into an ardent wine lover after this tour. Some of the best-known vineyards in Bangalore are Soma Vineyard, Grover Vineyard, Heritage winery and Nandi Valley winery. Soma Vineyard sprawls over 100 acres and couples can discover the intricate process of wine-making, right from picking the grapes to harvesting to extracting the juice. You will get to know of the fermentation process as well and will be ushered to three distinct locations for tasting wine. Grover Vineyard is one of the oldest vineyards, located in the outskirts of the city. You can take your partner out for a lunch/dinner at this vineyard when travelling to Nandi Hills. Wine enthusiasts can learn more about wine-making since they provide complete education and courses for the same. You can also take your partner on a romantic drive of 80 kilometres from Bangalore to Heritage Winery where you can learn about the fermentation and blending of wines. If you want to go for wine-tasting, but also have a fun trip, take a trip to the Nandi Valley Winery. Here, they provide you with the opportunity of wine stomping and a wine buffet thereafter. You get to squish the grapes placed on a huge barrel with your partner, the grapes which are later fermented. This adds a fun element to your wine-tasting session. A weekend cannot get better with so many options of wine-tasting. Things to do: Wine Tasting, exploring the process, grape stomping, sunset views and taking a walk on the fields are the prime activities couples do on a vineyard tour. As an addition to wine tasting, one can enjoy wine and cheese pairing sessions. 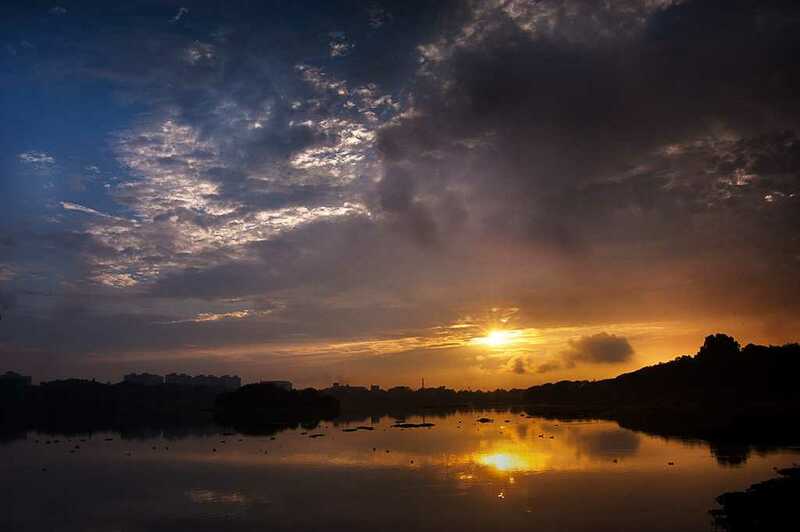 Situated in the western part of Bangalore city is a picturesque man-made lake, Sankey Tank. It has turned into a popular hangout spot for couples. You can spend a romantic day, walking on the lovely track and watching the green cover of trees with your soul mate. There are boating facilities too. The ambience of the lake becomes more romantic as the sun sets and the migratory birds fly past it. The entire aura of the place fans the flames of love further between you two. Sankey Tank includes a park as well as a swimming pool in the south along with nursery by Forest Department in the North. The landscaped park is a major attraction for the nature lovers. It is an ideal spot for the bird watchers too since you get to find interesting water birds like black egret on the island. The couples can sit or walk in the park, surrounding the lake and enjoy the serenity around. It is recommended that you visit the lake during sunrise. The entry fee is only ?10, but the experience is worth a million bucks. Things to do: Nature walks, viewing sunrise and sunsets, photography, boating, bird watching and jogging are some of the activities people do in and around Sankey Tank. The ambience is simply perfect for couples to spend a romantic time, in the lap of nature. For couples who want to spend some quiet time in natural surroundings, Thottikallu Falls is a must-go. It is recommended that you and your partner enjoy the beauty of off-roading and these falls post monsoon since it is at its best at that time. It is located 35 kilometres from Bangalore City, which means a romantic drive. Since this place is not too far from the city, you can enjoy your weekends here after a hectic week. Locals have given the name Swarna Mukhi to this waterfall, meaning 'Golden-faced'. At the entrance of the arena is a half-broken road with a bridge to the right that leads to a temple known as Muneswar temple. You'll approach a barren land on the right which leads to the waterfalls. You can also opt for an adventurous trek to the waterfalls directly by walking straight and then left, on entering. The steep, narrow, rocky trail leads to the point from where the view of the waterfalls is just breathtaking. The path is dangerous and you must be cautious. You and your partner can play with the cool showers on reaching the falls. You must carry along some eatables since there are not many food vendors in the area. You must prefer to go there on two-wheeler because the roads are quite narrow. There are a lot of bike expeditions conducted in this place. Muthyalamaduvu is another scenic waterfall, at a distance of 43 kilometres from the main city. It is also popularly known as Pearl Valley because Muthyala means Pearl and Maduvu means pond or pool in Kannada. It serves as an ideal picnic spot, is located in the midst of hills and green surroundings. It is recommended that you visit the place during the first half. You can enjoy the picturesque views of water falling from 100 feet with your partner and visit the Shiva temple, a small shrine in the area adding some religious charm to the place. If you visit the place during monsoon, you will find the waterfalls flowing at a good speed and the greenery increases too. The place is secluded and serene, which has made it a popular place for couples to hang out. Things to do: Mostly popular for picnics, one can enjoy clicking photographs and bathing in the cool showers. Bangalore is known for its luxury spas. After a hectic week, you can enjoy a de-stressing couple spa therapy with your partner. It is suggested by health experts that you should take certain measures for a healthy lifestyle. This is a great measure and there are lots of options in Bangalore for the same, where you can book a couple massage therapy. Some of the popular ones are White Mantra Spa Salon, Angsana Oasis Spa and Oberoi Spa and Fitness Center. You can get some sophisticated spa therapies like Wine therapy or Hawaiian Fantasy at White Mantra Spa Salon, which is known for the tranquillity it offers. Angana Oasis Spa is another place to pamper your partner with special 'for him' or 'for her' compiled packages. Oberoi Spa and Fitness Center is an experience full of relaxation blended with Ayurvedic wisdom, where the two of you can surrender yourself to expert hands and ensue your worries away. So, book in an appointment for any of these spa therapies and take the first step towards a healthy lifestyle. So heads up, there's your curated list for a date night!